This versatile air pillow packaging machine is fully automated and requires little set-up, training or operator involvement. The entire air bag packaging system is designed to reduce dedicated inventory space, with compressed material taking up less than 1% of its inflated volume. With over 25 years of experience in Logistics, Warehousing, Transportation, and Manufacturing, in a wide variety of industries, RedStone is primed to help you with your packaging needs. As a regional distributor of Pregis’ industry leading packaging products, RedStone is ready to assist you in all of your packaging needs. 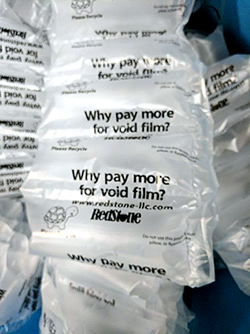 From money saving, high speed inflatable packaging fillers to foam in place packaging systems, RedStone and Pregis are ready to help you save money and package your products like a pro! Please leave us your contact information and a brief description of your packaging needs and we will get back to you with more information. Copyright © 2012, RedStone, LLC. All Rights Reserved.